The SpaceX Dragon cargo capsule is moved into its final position on the International Space Station's Harmony module on March 3, 2013. The successful docking of SpaceX's Dragon capsule with the International Space Station on Sunday morning wrapped up the second major headache billionaire entrepreneur Elon Musk had to tackle recently. Just three weeks ago, he took on the New York Times over a review of the Model S electric car, made by Musk's other technology company, Tesla. Musk and a team of engineers with private spaceflight firm SpaceX scrambled to save the robotic Dragon capsule after a glitch following its launch toward the space station on Friday (Mar. 1). SpaceX's Falcon 9 rocket delivered Dragon to orbit just fine on Friday (Mar. 1), but three of the capsule's four thruster "pods" that allow it to chase down the space station initially failed to activate as planned, imperiling the company's second contracted cargo delivery for NASA. Engineers determined that pressure levels were abnormally low in some of the tanks containing Dragon's oxidizer, which ignites the thrusters' fuel. That suggested a possible blockage or stuck valve, SpaceX officials said. "We've been able to free that up by cycling the valves, essentially pressure-hammering the valves, to get that to loosen up," Musk said during Friday's press conference. "That looks like it's been effective." Indeed, the misbehaving thruster pods came back online, and Dragon then executed an orbit-raising engine burn on Friday afternoon, clearing the way for the capsule's space station rendezvous Sunday (March 3) — just one day later than originally planned. SpaceX holds a $1.6 billion contract to make 12 unmanned cargo flights to the International Space Station. Dragon is carrying 1,200 pounds (544 kilograms) of supplies and scientific experiments up on this mission, and it's slated to bring 2,300 pounds (1,043 kg) of gear back down to Earth on March 25. 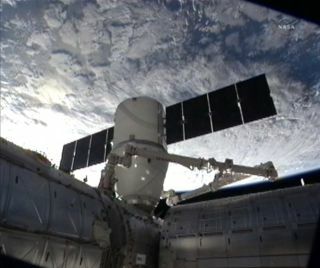 Dragon vehicles experienced no major problems on their first three spaceflights — a trip to Earth orbit and back in December 2010, a historic demonstration mission in May 2012 during which Dragon became the first private vehicle to dock with the station, and SpaceX's first bona fide cargo run last October. The Dragon glitch comes on the heels of a very public spat between Musk and the New York Times after a reporter wrote a harsh review of Tesla's new electric sedan, the Model S.
Times reviewer John Broder wrote that the Model S was an example of how "theory can be trumped by reality," and said the vehicle ran out of juice during a cold-weather trip from New York to Boston. Broder's article was accompanied by a photo of his Model S test car being ignominiously hoisted onto a tow truck. Musk took umbrage with the Feb. 8 article and, as with his SpaceX missions, took the conversation to Twitter, calling Broder's review "fake" and accusing him of purposely trying to sabotage the test drive. Musk even published the vehicle log data from Broder's test drive to make his case. After several online back and forths between Musk and Broder, the New York Times public editor Margaret Sullivan investigated the matter. She concluded that Broder's story was done "in good faith" but rebuked the reporter for keeping "casual and imprecise" notes. Musk said on Twitter that his faith in the Times was "restored." Musk later claimed that Broder's article cost Tesla $100 million. "We did actually get a lot of cancellations as a result of The New York Times article," he told Bloomberg TV. But like SpaceX, Tesla appears to have weathered the recent drama. Musk recently said that he expects Tesla to repay the $465 million that it borrowed from the U.S. Department of Energy in five years instead of ten. This story was provided by TechNewsDaily, a sister site to SPACE.com. Follow TechNewsDaily on Twitter @TechNewsDaily, or on Facebook. Follow SPACE.com senior writer Mike Wall on Twitter @michaeldwall or SPACE.com @Spacedotcom. We're also on Facebook and Google+.